Nephrology and Urology Devices Market To Surge Beyond USD 31.3 Billion By 2024: Grand View Research, Inc. 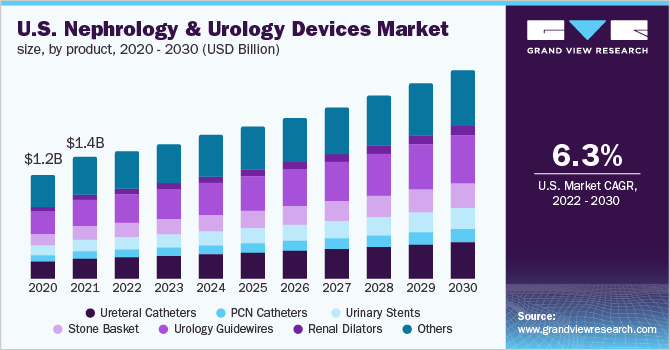 The global nephrology and urology devices market size is expected to reach USD 31.3 billion by 2024, according to a new report by Grand View Research, Inc., exhibiting a 7.1% CAGR during the forecast period. Increasing prevalence of chronic kidney diseases is expected to fuel market growth. This high prevalence of diseases can be attributed to unhealthy lifestyle habits of people around the world. Moreover, growing geriatric population, who are more prone to hypertension, obesity, diabetes, urinary disorders, and other kidney chronic conditions, is expected to fuel demand for nephrology and urology devices. Advancements in device technology, such as inclusion of prosthetics in urology, percutaneous methods for stone disintegration and extraction, and extracorporeal shockwave lithotripsy, are anticipated to boost the market over the forecast period. Furthermore, presence of highly advanced pipeline products such as bioartificial kidney is presumed to present the market with lucrative growth opportunities in future. Increase in demand for minimally invasive techniques is also likely to propel the market in the coming years. Nephrology and urology devices facilitate early diagnosis and shorter treatment duration in most surgical procedures. Minimal pain, heightened cost efficiency, safety, efficacy, rapid recovery, and reduced hospital stay are other benefits offered by these devices. This is expected to boost adoption over the forecast period. Some of the key players in the market are Baxter International, Inc.; Fresenius Medical Care AG & Co. KGaA; Boston Scientific; and C.R. Bard Inc.